Will Firearm Filibuster Bring Progress? Wednesday's filibuster didn't have as dramatic an ending as the movie version. Whether Sen. Christopher S. Murphy&apos;s filibuster to promote gun legislation Wednesday yields much more than "sound and fury signifying nothing," might well depend on what happened away from the cameras. A number of senators from both parties were circulating proposals into Wednesday evening intended to curtail the ability of suspected terrorists to buy guns. When Murphy stepped down after 14 hours early Thursday morning , he said Senate leaders had agreed to consider amendments on keeping guns out of the hands of terrorists and tightening background checks on firearms sales in certain cases. The reemergence of gun policy debates, as well as the hours-long holding of the Senate floor by Murphy, a Connecticut Democrat, comes in response to the weekend&apos;s mass shooting terror attack in Orlando . Senate Majority Whip John Cornyn said he and Democratic Sen. Dianne Feinstein spent much of Wednesday looking for consensus on how to best keep individuals on federal terror watch lists from buying guns . The Orlando shooter had been monitored by the FBI in 2013 and 2014, but was no longer on the watch list. "There&apos;s no debate that we both want to keep guns out of the hands of terrorists. We want to make sure it&apos;s done in a constitutional way," the Texas Republican said earlier in the day. In December, Feinstein proposed an outright ban on gun purchases for those on the list, while Cornyn suggested a waiting period during which the Justice Department could take legal action, a position supported by the National Rifle Association. Cornyn said the California Democrat had already presented him with what was, "basically a re-write of her proposal from last December. I told her we&apos;re looking at it. We&apos;ll see if we can find some common ground, but we&apos;re still in that process." Feinstein filed a modified version of her past proposal as an amendment to the Commerce-Justice-Science spending bill pending on the floor. "I think the ability to be able to prevent this kind of perpetrator from buying a weapon, the most sophisticated styling like a military assault weapon is important. So, we will see if we can come to terms," Feinstein said. "These people who would commit these crimes are not stupid. And they may have other problems, but they&apos;re not stupid, and they listen to what goes on, and they figure what they can do based on what goes on." 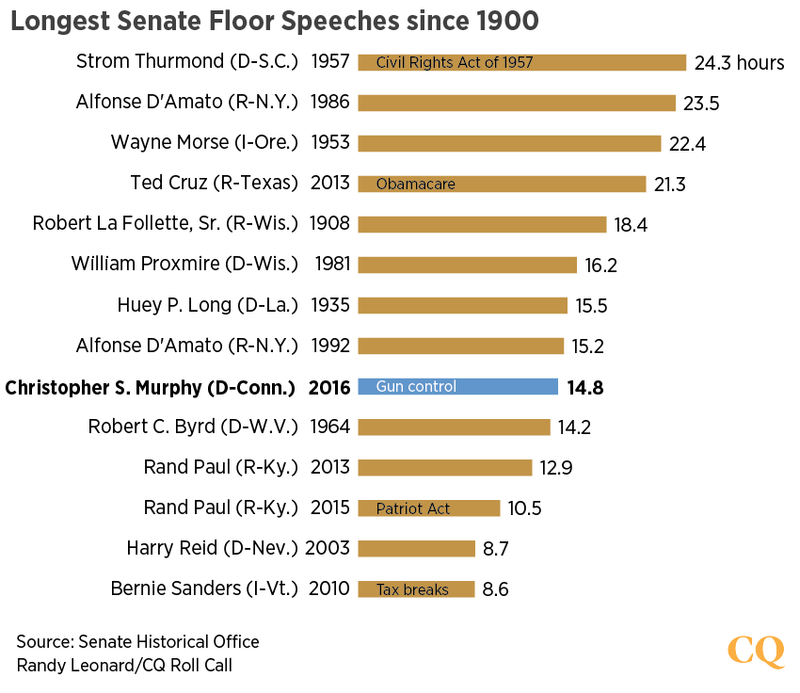 It seemed doubtful, though, that the long day of Democratic speeches would yield a result other than a set of votes on the Senate floor where neither side gets enough votes to advance. "I&apos;m supportive of resolving that issue, and certainly would work with anyone to do that," Sen. Kelly Ayotte, R-N.H., said in an interview Tuesday about the efforts to keep terror suspects from legally buying guns. During Wednesday&apos;s floor debate, Murphy noted that no Republican lawmaker had approached him about finding a compromise between the Cornyn and Feinstein plans until Wednesday. "We&apos;ve had six months since the failure of the last measure ... to work on this," Murphy said. "None of that happened until we took the floor here." The terrorist watch list debate is far from the only issue. Democratic Sen. Joe Manchin III of West Virginia and Republican Sen. Patrick J. Toomey of Pennsylvania are trying to revive their effort to enhance federal background checks and curtail the so-called "gun show loophole" that allows buyers to avoid a background checks. Manchin told reporters that his amendment was neccessary to even make the Feinstein proposal work, since would-be terrorists could still work around the background check system fairly easily if it is not enhanced. "You can&apos;t do a no fly-bill, you can&apos;t do a terrorist watch list and then leave a loophole," Manchin said. A separate proposal from Toomey regarding watch lists was immediately panned by Democrats, with Minority Leader Harry Reid of Nevada criticizing it late in the day. "At no point today have Democrats seen any proposals from Republicans that come close to attracting Democratic support," Reid said. "Senator Toomey&apos;s proposal would make it more difficult for law enforcement to keep guns out of the hands of terrorists by forcing the FBI to jump through more hoops than the already unworkable bill proposed by Senator Cornyn." Beyond gun legislation, Democrats are pushing for more money for federal investigators . Sen. Barbara A. Mikulski, the lead Democrat on the Appropriations Committee, is proposing $175 million in emergency spending that would provide for, among other things, 300 new FBI agents to combat terrorist threats. "Words are one thing, deeds are another," the Maryland Democrat said. "While America grieves and America bleeds, we want to take action, prevent it from happening again." Mikulski&apos;s proposal would take the spending bill beyond budget caps agreed to last year, which could make it hard to win GOP approval. Contact Lesniewski at NielsLesniewski@cqrollcall.com and follow him on Twitter @nielslesniewski .